Although I’ve been going to horror film conventions since 1985, it wasn’t until 1991 when I attended my first Chiller Theatre expo, which at the time was called Son of Horrorthon. I’m guessing Horrorthon had been the name of an earlier version? Either way, back then the convention was held in Cherry Hill, NJ, at a small but accommodating campus. Then they began to grow, and eventually moved to a couple of hotels in Secaucus, right across the highway from Giants Stadium, where they held court until about five years ago, when they wound up in the Hilton Parsippany in Parsippany, NJ, where I’ve just returned from their “2012 Spring Spooktacular.” Chiller runs two conventions a year, in April and again the weekend closest to Halloween. While the conventions run one evening and two days, I usually attend on Saturday, meet the couple of guests I’d like to meet, cruise the huge dealer’s room, and then leave. At the aforementioned Son of Horrorthon, while crowded, it was still under control. I was able to meet a couple of my horror heroes (a particular fan-geek moment goes to my discussion with director Herschell Gordon Lewis and his lovely wife) and get some photos and items autographed FREE of charge. In the early days of Chiller, guests gladly signed anything for free and happily took pictures. The talk of the day at the 1991 convention was guest star Butch Patrick, the actor who had played Eddie Munster on the 60s sitcom, The Munsters. People were openly complaining that he was charging $30.00 for an autograph. I remember countless people bad-mouthing him for his audacity … and yet 21 years later, this practice has become the norm at both Chiller and Fangoria conventions. A few years later (mid 90s) you saw guests starting to charge $5.00, then $10.00 for an autographed picture, or to sign your own item. Most of them usually still had no problem taking pictures with their fans for free. I didn’t have a problem shelling out the five or ten bucks to meet some of my favorite actors, directors, and FX people, but by the late 1990s, EVERYONE seemed to be charging $20.00 for an autograph … and today the norm is between $20.00 and $30.00. Suffice it to say, what was once a great, fun time has become a way over-priced event that STILL somehow manages to draw some of the largest crowds this side of Comic Con. But what’s more questionable than the prices are the majority of the guests: Chiller Theatre is named after an old TV show, where classic horror and sci-fi movies were played late on Saturday nights. Chiller has since become an anything goes convention: over the past ten years there’s been more former wrestlers and non-genre TV stars than there’s been horror and sci-fi people. There was even an F-Troop reunion a few years ago! I’ve been saying for years that Chiller seriously needs to change their name. While the dealer’s room is still mainly horror oriented (and as far as I’m concerned, the main reason to attend this convention), Chiller’s guest list reads like a who’s who of has-been’s and have never been’s. “Actors” and “directors” sit at booths selling their cheap, shot-on-video productions, attempting to lure people in with scantily-clad women dressed like Vampirella ; Former wrestlers justify Mickey Rourke’s depressing convention sequence in his film The Wrestler; Former TV stars attempt to show interest in their fans (thankfully most seem interested, but there are many gems, including a certain cast member from Star Trek—charging $30.00 an autograph—who once sat there reading a book as he signed some poor schmuck’s photo); and possibly the saddest of all, self-published writers who have NO CLUE how the business is run, hocking their horribly-edited novels and wondering why no one is stopping by their table. In fact, aside from Doug Winter and Jack Ketchum (who stopped attending Chiller a few years back), Chiller is simply NOT for horror writers. It’s a film expo full of people looking to find horror film T-shirts, rare DVDs and theater posters. I’m often asked, “Why do you still attend?” There are two reasons: the dealer’s room and the one or two guests they usually have on hand who I find interesting. As mentioned, Chiller’s dealer room is one of the largest and best of any film convention I know of. There’s an endless array of horror-related merchandise that anyone can spend an entire weekend browsing through. Nick Cato with actress Luciana Paluzzi from the 007 classic Thunderball and the the scifi classic The Green Slime. At the latest Spring Spooktacular, I found a couple or films I had been hunting down for some time now, and there were two guests I was interested in meeting. One was Luciana Paluzzi, the beautiful actress who starred in the 007 classic Thunderball as well as the sci-fi classic The Green Slime. She was every bit as classy as her on-screen personas suggested. And when she found out I was a fellow Italian, she graciously signed a picture of herself for me in Italian. It’s personal little things like this that separate the thankful guests from the couldn’t-be-bothered types. Also on hand was actor Laurence Harvey, star of the controversial The Human Centipede 2. Not only was he a soft-spoken English gent, he had no problem signing anything you wanted, and even hammed it up by donning the bloody lab coat he had worn in the film. You’d never believe a man this nice could star in such a depraved film! It’s rare meetings like this that still make Chiller worth fighting your way through the over-priced crowds. 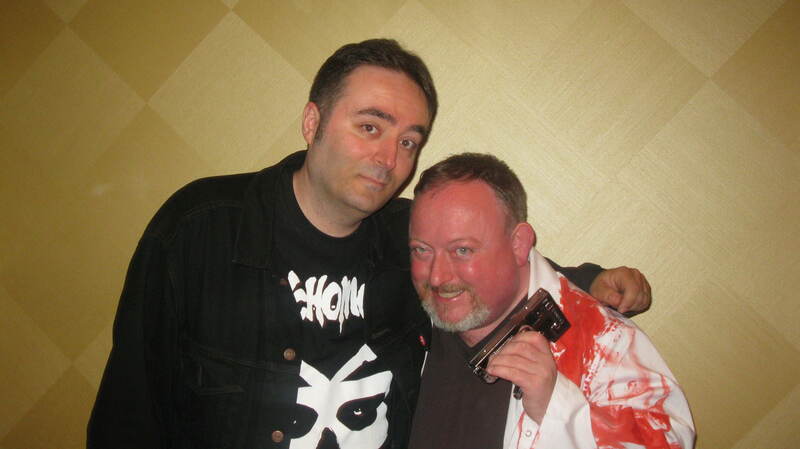 Nick Cato with actor Laurence Harvey from The Human Centipede 2. At this particular Chiller, the largest line was to meet actor Norman Reedus, who was there as part of a Boondock Saints reunion, and of course to represent The Walking Dead. I can’t remember the last time I saw girls walking around with autographs so taken aback by someone … you’d think the Beatles were doing a reunion show. Being a fan of the low-budget stuff, you get to meet the smaller stars a lot quicker as they rarely have long waits to see them. Of course there are exceptions: the first time Ken Foree from the original Dawn of the Dead appeared, I think I waited close to 40 minutes to meet him. But the wait was well worth it and I’ve since had the pleasure of meeting him several more times and have even exchanged several emails. The glory days of Chiller Theater are long gone. It has become an over-crowded, over-priced convention that is more of a nostalgia-fest than a horror con. But as long as they keep their amazing dealer room, and the one or two genre guests who grab my interest, I’ll probably continue to attend, even if it’s only to pop-in for a few hours during one of the three days. That is, until every guest jumps on the current trend of “photo ops,” where you have to pre-pay $50.00 to meet with a particular guest in a private room to have your picture taken with them by a pro photographer. Thankfully only a few of the bigger guests have been doing this, but if it becomes widespread there’s a good chance it will mean the end of Chiller. Very nice. My dad took me to see THUNDERBALL when I was 7 years old. I had seen it on TV but they had a revival at a local theater. Been ga-ga over her since then! Hi Nick,I just want to say I love what you wrote.I actually felt like I was reading about myself.I too go to chiller for the 1 or 2 stars I want to see and for the dealers table.I’ve been going for years and it seems that most of these stars today I’ve never even heard of.That’s why I cherish the couple of stars from yesteryear.Lately everytime I see the new list i’m like “Who are these people?” It’s a shame they got so greedy with overpricing everything.It sure isn’t what it used to be.Once again you make great sense in what you said. Thanks Philip. They have a great line up so far for the October show this year but I’m on the fence. The crowds have really become almost unbearable. Yes Nick,you’re right.The crowds in April were unbelievable. So far the October show looks good and the list isn’t even finished yet.